When it comes to street performance, cold air intakes and exhaust systems are typical upgrades used to provide a little something extra in the horsepower category. But what if there was a more powerful, less expensive alternative? The Safe Shot Nitrous System from ZEX offers an affordable option to gaining 15 to 35 instant horsepower, and it installs in less than an hour. In addition to low cost and ease of installation, the Safe Shot includes the quality components that ZEX is known for such as stainless steel hoses, high-flow bottle valves and premium quality, USA-made solenoids. The centerpiece of this kit is the 5 lb. black powder-coated bottle which is perfect for discreet mounting locations – making this the ultimate “cheater” nitrous system. A completely self contained kit, the only additional part needed is a common hand-held programmer used to increase fuel enrichment for safely operating at the upper limits of the horsepower range. These push-button activated nitrous systems readily accept all popular accessories like purge kits and remote bottle openers. 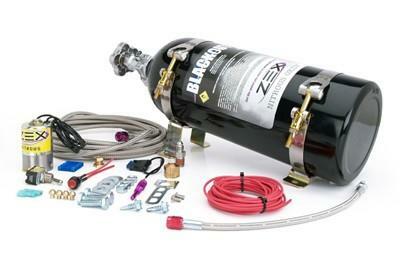 For those who are ready to upgrade to more serious horsepower, ZEX offers an expansion kit that turns the Safe Shot into a full-blown ZEX Nitrous System capable of safely adding 55 to 175 horsepower. The only “upgradeable” entry-level nitrous system in the industry, the Safe Shot is guaranteed to surprise both you and your competition.